EFFECT: During your opponent's Main Phase, you can Synchro Summon using this card you control as Synchro Material Monster. EFFECTS: If this card is used as Synchro Material Monster, the other Synchro Material Monster must be a Level 4 or lower Warrior- or Machine-Type Monster, and that Monster has its Level treated as 1. Effect: Once per turn, you can activate this effect by removing 1 Xyz Material from this card and selecting 1 WATER Rank 3 or lower Xyz Monster in your Extra Deck. Special Summon it. During the turn you activated this effect, this card cannot attack. but yeah if levi or acid golemn gets a chaos number like utopia then this card could get a little ridiculous. note: bahamut sharks effect is not confirmed, but i'm sure hes not gonna get his effect changed. and then canopy star dyson sphear second eff is just broken. 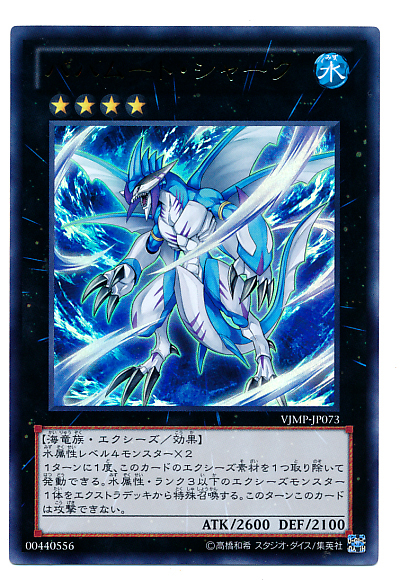 that probably the biggest reason it's rank 3 or lower water monster, to prevent the brokeness it could be but i think there will be more water xyz in abyss rising so that card still has something to look forward to. as for mono synchron the fact that it has to be a warrior or machine type monster bugs me a little but meh. During your opponent's Main Phase: you can Synchro Summon (from your Extra Deck) using this face-up card you control as a Synchro Material Monster. Formula Synchron, for all its bad rep (largely due to its associations with T. G. Hyper Librarian), was at least good at turning itself and Librarian or some other random Level 5 into Black Rose Dragon fodder. This? Wait, what Synchros are there that you can run into in times of great need on the opposing turn that you won't turn to in your own turn, beyond Black Rose Dragon? 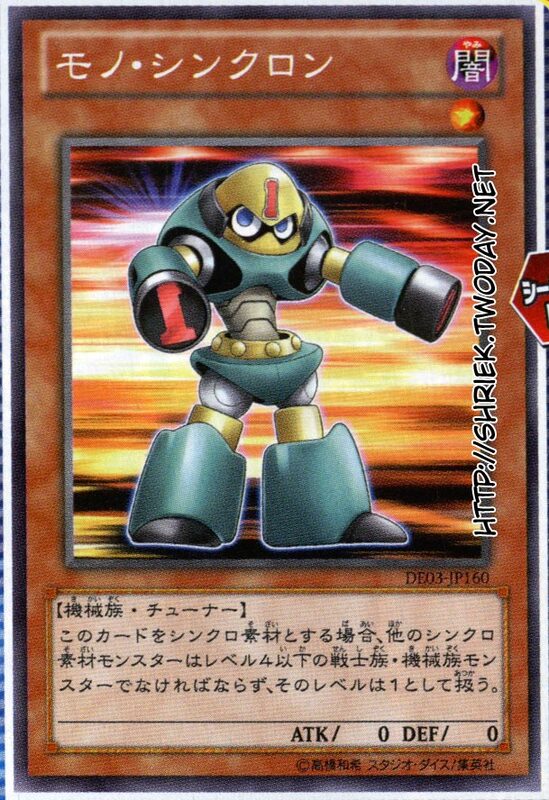 If this card is used as a Synchro Material Monster: the other Synchro Material Monster must be a Level 4 or lower Warrior- or Machine-Type Monster, and that Monster has its Level treated as 1. A universal complaint about Tuners is their lack of speed (that only a precious few have transcended due to their ability to Special Summon themselves, like Plaguespreader Zombie and Quickdraw Synchron, or else summon what would be Synchro Material, like Black Salvo or Junk Synchron or Debris Dragon). 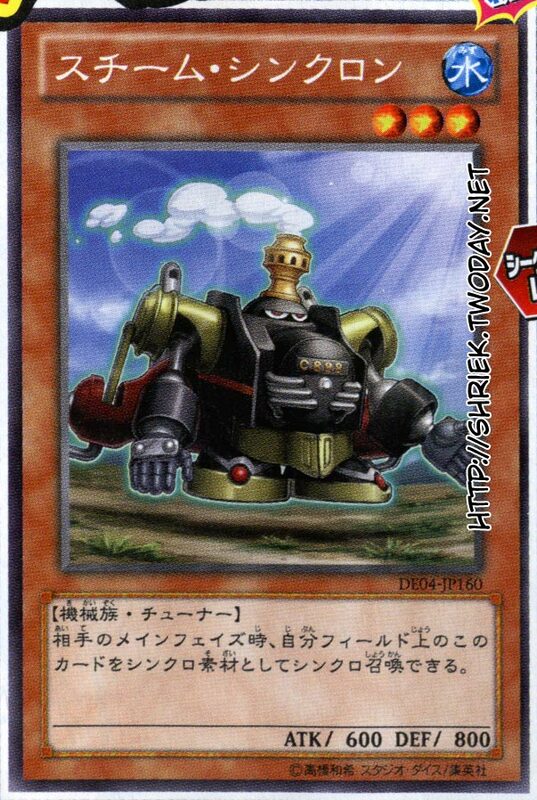 What makes this card even more janky than it already is is that it cannot be used for anything but the summoning of Level 2 Synchros, and that the other Synchro Materials must be Level 4 or lower Warriors or Machines. Once per turn: You can remove 1 Xyz Material from this card; Special Summon 1 WATER Rank 3 or lower Exceed Monster in your Extra Deck. This card cannot attack during the turn you used this effect. ... can you say 'a complete and utter waste of trees, ink, and brainpower'? You can't? Well - I can, because I am irked this exists. Well, I do enjoy the concepts of the xyz, and the first card. The first card allows you to conserve yourself to make plays during your opt turn that could also ruin their play, but the xyz is pretty well made, for you can get game if you play with it properly. For the level one mono synchron, I don't necesarily enjoy it since i would be playing other cards instead if i wanted formula out that badly.